Summary: Our cellphones, our clothes, our food: All are everyday things we consider essential, but we seldom think of what and who is involved in making them and getting them into our hands. 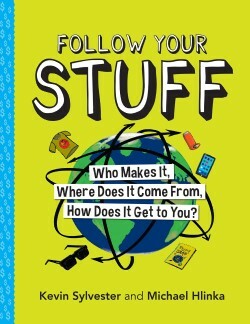 In Follow Your Stuff, award-winning children’s author Kevin Sylvester and business professor Michael Hlinka team up again, this time to tackle the complex dynamics of the global economy, examining the often-complex journey of ordinary goods from production right to our doorsteps. Using familiar examples, easy-to-follow charts and graphs, and a big helping of humor, Hlinka and Sylvester introduce young readers to concepts such as relative value and fair wages and how to think critically about our purchasing decisions. Sylvester’s lively illustrations add even more kid-appeal making this sequel to the critically acclaimed Follow Your Money the perfect introduction to socio-economics and an eye-opening essential read for young people. The book does it again for an asthma inhaler, this very book and a cell phone so you can see how much it takes to create a product. The book is large but skinny and includes just enough information to get a child thinking. It’s designed for ages 11+. Buy Follow Your Stuff at Amazon.com and help support the blog.